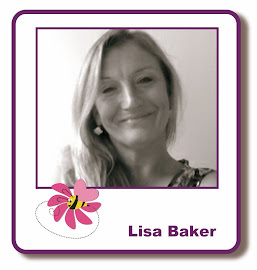 Welcome to Lisa.B.Designs : Polkadoodles: Bright and Beautiful Daisy Days! Good morning crafters! Martina here with this week's post and I am going for bright, bright, bright! Oh yeah, Lisa and Kirsten are rubbing off on me, the inks are out, so hang on to your sunglasses chaps! I started my card using three different colours of Distress Inks: Mustard Seed, Cracked Pistachio and Mermaid Lagoon. I striped each colour across my card and then proceeded to blend them into each other. Once happy with my blending, I lightly spritzed some water onto the card to create a blotchy, less perfect look. Once dry, I took the Bubble Background Stencil and used the same inks to add some bubbles to the topper. I also used some Hickory Smoke Distress Ink to add some of the flowers from the Paperartsy PS060 Stencil, as these would appear to be in the distance once the other layers were complete. Now turning to the main features: I stamped all the flowers I wanted from the Polkadoodles Daisy Days Set directly onto my topper, not worrying about overlapping the blooms at the top. 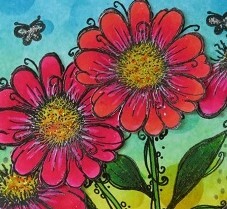 I then stamped the flower heads onto plain card and coloured them in with bright colours (I used Kuretake pens). I cut the daisies out and covered the stamped ones on the topper (ignoring the curly bits, as the stamped ones would have these on!). I coloured the stems and leaves that were showing with bright greens and added some butterflies from the same stamp set. I added some words from my stash and some detail with a white pen. Some basic matting and layering to set of the colours and there we have it! Thank you for reading; you can take your sunglasses off now! I hope you like it and I will see you next week!